Geoconservation, sometimes called Earth heritage conservation, is a relatively new concept. It means conserving Earth's geological and geomorphological features for the same reasons that habitats are conserved, namely that they have intrinsic value in their own right; that they are of value in scientific research, education and training; and that they are of aesthetic value, often within a cultural framework. Today, it is common to refer to the concept of geodiversity to match that of biodiversity; geodiversity recognizes the variety and depth of the geological resource and expresses its richness to the layperson. Geoconservation has a tough time of it, though. For most people, the concept of fragility or of endangering a resource is one that is almost exclusively biological. Through the increase of awareness in "green" issues, most people on the planet understand the need to protect species and habitats, and the high-profile causes of the African elephant and Amazonian rain forest have captured the public imagination for decades. But geological features are all too often built over, quarried or destroyed through negligence before anyone can raise a voice in protest. While the concept of geoconservation is new in most countries, Great Britain has a framework for protecting geological resources that has been in place for more than 50 years, with roots that stretch back to the late nineteenth century. Across Europe and America, this century was marked by popular interest in natural history, spanning birds, ferns, conchology and lepidoptery. Scientists were often gifted amateurs or landed gentry with time and money to spare. In industrial Britain, the development of municipal public parks for the health of the people saw the creation of collections of exotic plants under glass or of zoological collections, and the re-creation of geological features in sometimes grand style  such as the geological illustrations of Crystal Palace Park, where the English landscape garden is offset by a vision of an "antediluvian" world, populated by the first full-size reconstructions of dinosaurs sitting on the same rocks that entombed their fossil remains. Similarly, the grand, cathedral-like British Museum (Natural History)  now simply The Natural History Museum, opened in the 1870s  was a homage to all natural history, animal, vegetable and mineral. The Victorians understood that geology was a significant part of the natural world, supporting and helping nurture the habitats and wildlife that live upon the rocks and soils beneath. It is to be doubted whether such a truly "holistic" view of the natural world exists today. It is not surprising, then, that when concerns over the loss of species and habitats were raised in Edwardian Britain  driven at least in part by concerns over the use of exotic bird feathers in ladies' hats  that geology would be part of any discussion. And so it was that the SPNR  the Society for the Protection of Nature Reserves, an influential group set to establish reserves within which natural features could be protected  included "geological and physiographical" features in its definitions. Although their successors, the Royal Society for Nature Conservation, have recently abandoned their commitment to geology, the legacy of the SPNR was to influence British conservation in the post Second World War world, in which conservation was influenced by the idea of making Britain a home "fit for heroes." 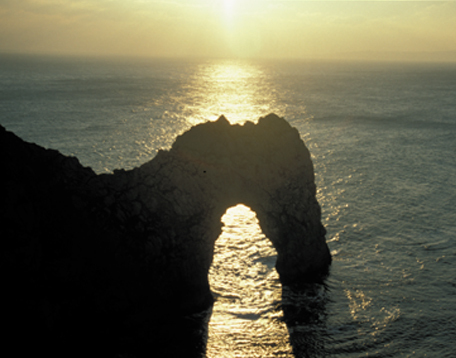 The Jurassic Coast (in Dorset and East Devon Coast, England) is home to many samples of the processes of erosion and accretion, including Durdle Door, opened as the sea eroded this Portland Limestone. Read more here. Photo by John Chaffey, chairman of the Dorset Geologists' Association. Thus, as World War II was in its final phase, the development of an integrated strategy for protecting the British countryside was begun. Britain is a heavily urbanized country, with 80 percent of its population living in urban centers today. It is also a heavily populated country, and a small one; as such forward thinking was required in order to protect the fragile resources available to the British public. The influential Natural Parks and Access to the Countryside Act of 1947 was the legal framework that set up the concept of the National Park to preserve some of the most outstanding "jewels" of the British countryside from insensitive development, and provide public access so that the people of Britain could see what they had been fighting for. This act was primarily based on cultural and aesthetic conservation, borrowed from the same concepts in other countries; but it also included an innovation: the protection of a network of sites to represent pure science. This innovation had its roots in the work of the SPNR, which had idealized "nature" conservation into the protection of nature reserves with a definable scientific interest and distinct boundary. The Act was to make this a legal reality. To set up this network, the government created an organization called the Nature Conservancy, which was empowered to designate parts of the United Kingdom as Sites of Special Scientific Interest, or SSSIs. These sites were to be selected on the grounds of objective scientific worth alone; and, following the lead of the SPNR, the Nature Conservancy was to select those sites deemed representative of not only the most special and scientifically important habitats, but also "geological and physiographic features." The pressures that come with an increasing population also threaten nature conservation in its wider sense. SSSIs remain the cornerstone of the British response to these threats. The Nature Conservancy is now split into four separate agencies, one for each of the countries of Great Britain (England, Wales and Scotland) and one for UK-wide and outward-facing international issues. Northern Ireland has a separate, but effectively similar body. Together, these five agencies deliver nature conservation in the United Kingdom through the legal protection of endangered species, and through the designation of SSSIs. Each SSSI is designated on scientific grounds, and remains the property of the original owner. Some have been transferred into public care and are designated National Nature Reserves. Each is denoted by a boundary on a map, which delimits the extent of the scientific interest of the site. Sites have effectively no size limit; they can range from the smallest road cutting to the largest superquarry. But the one defining thing about them is the value of their contained science. Today, the country hosts 4,100 SSSIs, of which a third are wholly or partially geological. The complete stock of SSSIs in England alone covers more than one million hectares. Each has a list of Operations Likely to Damage  actions that would materially reduce the scientific interest at the site, and which must be subject to application to the respective agency before being carried out. Developers seeking planning permission to build, or quarry owners looking to extend their mineral rights, must first have their cases weighed against the potential damage to a given site. Although some SSSIs are lost, many are saved. Fortunately, the government's commitment to the SSSI concept has been strengthened recently with additional legislation, including the possibility for prosecuting third parties for wilful damage to SSSIs. Previously, the site's owner would have been prosecuted. By the 1970s, it was recognized that the SSSI network was a bit creaky, having been added to and supplemented in an unstructured way, and that in order to maintain the status of the designation, it was necessary to consider whether all the sites designated thus far were of national or even international importance. In this way, one of the most ambitious of all programs to investigate the geological resources of Britain was instigated by the Nature Conservancy Council: the Geological Conservation Review, or GCR. The GCR involved the recognition of networks of mutually supporting sites intended to illustrate the geological riches of Britain  of which there are many. As such, stratigraphical networks, concentrating on systems such as the Silurian or Jurassic; mineralogical networks, looking at mineralization phases; or paleontological networks, looking at vertebrates or paleobotany, were some of the many strands investigated. A good example of this is the British Lower Jurassic stratigraphy network; here sites along the Jurassic outcrop from North Yorkshire to Dorset represent the successive facies changes along this famous strip of England, each one the most important of its kind. No two sites show the same thing; each site meshes with the next to complete the network coverage. The concept is unique, and the value of the network strengthens the argument for each individual site. More than 2,000 GCR sites in Britain are protected as SSSIs, and the justification for each site is published in comprehensive volumes by the Joint Nature Conservancy Council. The GCR serves as a model of best practice that has been investigated by many nations examining their approach to geoconservation. If the GCR is an important innovation reorganizing the official British response to geological conservation, then another strand is of equal importance  that of nonstatutory protection of geological sites. In 1990 it was recognized that between the boundaries of the tightly controlled, scientifically top-notch SSSIs were many other sites deserving attention on the regional or local scale. These sites could not be included in the SSSI network because, were a subnational site included in the network, it would weaken the case in court battles over a given nationally important site. But a subnational site might be of value outside the SSSI network. On this basis, the Nature Conservancy Council encouraged interested parties to form loose affiliations to lobby local authorities to protect local sites of geological interest as Regionally Important Geological Sites or RIGS. Today, the RIGS movement has attained significant successes, and there are many RIGS groups within the UK that have persuaded their local authorities to adopt geological sites. One of the most successful RIGS groups is that hosted by the Black Country Geological Society. The group site is situated within the heart of what was one of Britain's heaviest industrial belts (the "Black Country" refers to the black smoke of the Victorian industry). Here the local authority actively promotes its geological heritage, seizing upon the uniqueness of its Silurian geology, and supported by its enthusiastic amateurs. There is no sign of the momentum in the RIGS movement abating, and together, the SSSI and RIGS are ensuring that Britain's enviable richness of geological resources are protected for future generations. Other countries are reviewing their approaches to geoconservation, and while the British model may not meet all needs, particularly in less populous or larger nations, the basis of scientific rigor and local adoption is one that can be successfully exported to any scheme. In the mid 1980s, while performing routine surveys on the continental shelf off the coast of British Columbia, Kim Conway and a team of researchers from the Geological Survey of Canada came across unusual, large mounds on the seabed. Those mounds turned out to be Hexactinellid sponges  enormous glass-like sponges that form complex 3-D framework structures. Nearly a decade later, German paleontologists, led by Manfred Krautter at the University of Stuttgart, took interest in the sponges. Krautter's team had been studying outcrops of a fossilized reef in Europe. In the upper Jurassic, about 150 million years ago, a vast reef of Hexactinellid sponges stretched 7,000 kilometers across southern Europe. As far as Krautter and his colleagues knew, that type of reef should have disappeared some 80 million years ago. They were thrilled to see the same type of sponge reefs living today  over about 700 square kilometers of seafloor between the Queen Charlotte Islands and Vancouver Island, Conway says. "With the opportunity that it presented to study a living system that was the only analog available to look at these ancient reefs, we formed a joint project in 1998," Conway says. 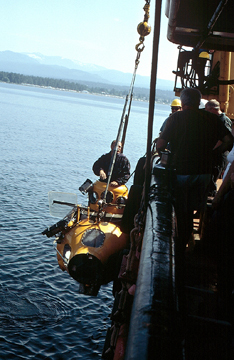 In 1999, joint Canadian-German team of scientists took the submersible Delta down into the British Columbian waters to observe and study the geology and biology of the Hexactinellid sponge reefs. The research has helped spur conservation and awareness of the unique reefs, which face potential destruction from fishing practices in the area. Photo courtesy of Kim Conway. Since then, the joint Canadian-German team has performed 18 submersible dives and conducted oceanographic surveys to better understand the unique conditions that created the sponge reefs. With help from the Canadian Parks and Wilderness Society (CPAWS), they have been working to make the sponge reefs in the Hecate Strait a Marine Protected Area (MPA)  a designated area with controlled activity to ensure long-term protection. Currently less than 1 percent of Earth's marine area is similarly protected, according to the U.S. National Oceanic and Atmospheric Administration. Around the world, geologically significant areas found underwater are gaining protection. At last year's World Summit on Sustainable Development in Johannesburg, countries pledged to create networks of marine protected areas by 2012. Just this year, Australia created the largest highly protected marine reserve at the Heard and McDonald Islands  home of Australia's only active volcano and several seamounts. In March, under the Oceans Act of 1997, Canada designated its first ever MPA: the Endeavor Hydrothermal Vents, located 250 kilometers southwest of Vancouver Island, 2.25 kilometers below the surface of the ocean. "The Endeavor site has had a lot of participation from scientists," says Sabine Jessen, conservation director of CPAWS in British Columbia. With Canadian and American dives to collect pieces of the underwater chimneys, marine protection has set controls over conducting research there. Similarly, for the Hecate Strait sponges, marine protection would allow for controlled scientific research in the area, while preventing harmful fishing activities. Although the full ecological importance of the sponge reefs has yet to be determined, dives last year shed new light on their underwater world. "Just as a coral reef provides habitat for a large numbers of tropical reef fishes, we suspect that the reefs on our shelf may play an important role in providing habitat or a nursery area or other types of required habitat for different fish species," Conway says. After finding new sponge damage last year from ground fish trawling, the government closed those fisheries; but, long line fishing and shrimp trawling are still in place. Because of the slow growth rate of the Hexactinellid sponges, between 1 and 7 centimeters a year, it could take anywhere from 50 to 150 years for that sponge reef area to recover, if at all, Conway explains. Exactly why this type of reef system, long assumed extinct, popped up in the British Columbia waters about 9,000 years ago is still unknown. "This part of our continental shelf has experienced this huge sea level change after the ice left; sea level rose up to about 140 meters, freezing in time this substrate that existed there during the glaciation," Conway says. This quiescent area is ideal for colonization by these sponges, which require stable, non-changing seabed to get a real hold on. High nutrient availability and upwelling, he says, likely also play a role. While Conway's research team is busy analyzing the latest survey data from the reef site, Jessen and her conservation team are continuing to lobby hard for the reefs to gain MPA status and designation as a World Heritage Site by UNESCO. She's optimistic. "More and more people are looking toward oceans and the need to better protect them." With portions already designated by the UK as Areas of Outstanding Natural Beauty and a Site of Special Scientific Interest, Dorset and East Devon Coast gained global recognition last fall when they were designated a UNESCO Natural World Heritage Site. The site joins the ranks of other Natural World Heritage Sites such as the Galapagos Islands, the Great Barrier Reef along Australia and the Grand Canyon in the United States. It also joins the UK's Giants Causeway in Northern Ireland and Saint Kilda in Scotland's Outer Hebrides as Natural World Heritage Sites. Dubbed the Jurassic Coast, the site spans roughly 95 miles from Orcombe Rocks in Exmouth, Devon, to Studland Bay in Dorset. Almost 80 percent of the coastline is undeveloped cliffs that are an accumulation of rock and fossils spanning almost the entire Mesozoic. Elements of coastal geologic features such as bays, beaches, lagoons, stacks and landslides are also preserved here. Important fossils such as ((Dimorphodon macronyx)), one of the earliest flying reptiles, along with numerous fossils of vertebrates, invertebrates and plants, have been found here. It is an excellent study area for understanding beach formation and a retreating coastline. Geologists have been working here more than 300 years, including Mary Anning, who at the beaches of Lyme Regis found the first complete fossil specimens of ichthyosaurs and plesiosaurs. UNESCO gives cultural, natural and mixed designations, and it was the geology of the Dorset and East Devon Coast that secured their designation as a Natural World Heritage Site. Long a favorite fossil collecting spot, the coastline has received even more visitors since earning its UNESCO designation (UNESCO estimates the designation will bring at least 14 million people every year). In September, Prince Charles visited Orcombe Rocks to commemorate the coastline's new status and to unveil a landmark at the gateway to the Jurassic Coast. Doyle is chair of the Geoconservation Commission with the Geological Society of London. He is the author of many papers and books on the subject of geoconservation, and is currently a visiting professor at University College London.